The geographic area served consists of the state of Alaska. Recruit Middle School Teachers/Teams to participate. Information on how to enter, promotional videos, curriculum and much more can be found at here. Volunteer as a mentor. This is an exceptionally rewarding experience. These kids are great and very appreciative of any help we give them. We currently have teams signed up from Fairbanks, Anchorage, and Wasilla. Please contact me if you are interested in mentoring and I will help you connect with a nearby team. Volunteer as a judge. I am looking for a few individuals to judge the competition. This involves reviewing each proposal, attending the interviews, and scoring each entry. This activity will probably happen in early January. Please contact me if you are interested in judging. Alaska has had phenomenal success in the several years we have participated, winning the international competition both times and creating peak learning experiences for Alaska's middle school students. Support from the community and members is a big part of that success. Please contact me if you want to get involved. The Alaska Chapter is pleased to accept submissions of applications for grant funding for design and construction projects that transform Alaskan educational facilities and promote Alaska student involvement through hands-on learning in school planning, design and construction processes. 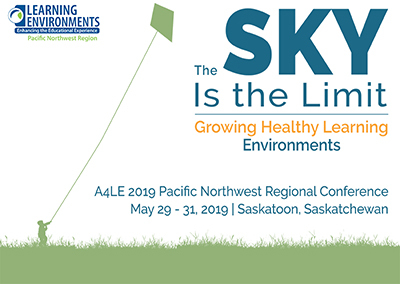 The Alaska Chapter is offering a scholarship up to $1,500 to attend the Pacific Northwest Regional Conference in Saskatoon, Saskatchewan on May 29-31, 2019. If you need financial assistance to attend our regional conference, please consider applying for the scholarship.